This is a plaster cast of a pulpit after marble original, with columns of porphyry and other stones by Giovanni Pisano (1250-1314) in Pisa about 1865. The original pulpit was located in the right forward corner of the choir in the Cathedral, Pisa. 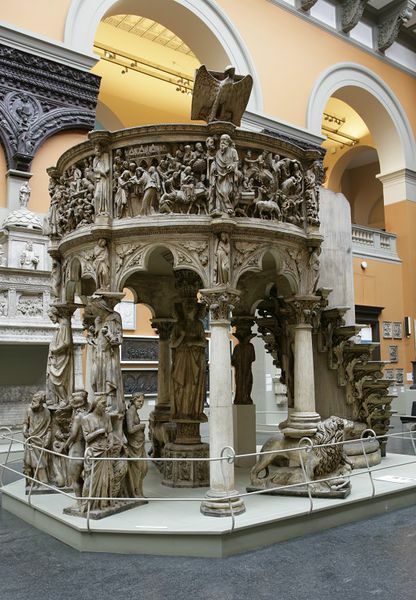 Following a fire in the cathedral, the pulpit was dismantled in 1602. A new pulpit by Fancelli was installed in 1627, re-using some of the sculpture from the old pulpit, while the rest, including the narrative reliefs, were used elsewhere in the cathedral. Interest in the original appearance of Giovanni Pisano's pulpit was re-awakened in the nineteenth century, and a Pisan sculptor, Giovanni Fontana, began working on a reconstruction, executed in wood in 1872 and now preserved the interest of a group of British sculptors, who produced their own reconstruction by 1865, before the completion of Fontana's model and differing in detail from it. This cast seems to be from this 1865 reconstruction, and a second copy of this cast was shown in the Exposition Universelle in Paris, in 1867. The present pulpit in the Cathedral in Pisa is a reconstruction by Peleo Bacci, executed in 1926. It differes substantially from the earlier reconstructions. Plaster Cast of a pulpit, after the marble original with columns of porphyry and other stones, situated in the Cathedral, Pisa. The pulpit stands on a raised circular base, and has two inscriptions running around a frieze beneath the narrative reliefs and round the base itself, attesting to the authorship of Giovanni Pisano, and that the pulpit was completed by 1311. Narrative Reliefs show scenes from the life of Christ and the Last Judgement. The central support is of the three Virtues over a base depicting the Liberal Arts; the two supports nearest the front in the cast depict Christ over the Four Evangelists and Ecclesia over the four Cardinal Virtues. a.The Annunciation, Visitation and Birth and naming of the Baptist, from the beginning of the cycle. b.The Damned, from the end of the cycle. At Pisa, this panel, together with the panel showing the Elect, form the Last Judgement, with the Saviour in the centre. 2.The back of the pulpit and staircase. In the 1926 reconstruction, the two additional panels, forming the beginning and end of the narrative, project from the back of the pulpit, with two modern wooden doors between them to provide an entrance to the pulpit. The staircase, which had been created by Fancelli from arch-brackets of the pulpit, and had been maintained in the 1865 and 1872 reconstructions, has now been abolished at Pisa, and the arch-brackets with reliefs of Evangelists and Prophets have been restored to the pulpit. 3.The supporting figures and columns are now arranged in a different order. Although the central support of three Virtues over a base depicting the Liberal Arts remains constant, the two supports nearest the front in the cast (depicting Christ over the Four Evangelists and Ecclesia over the four Cardinal Virtues) now support the base of the gallery at the rear of the pulpit at Pisa, and the positions of the other supports have been switched around. 4.The base and inscription. 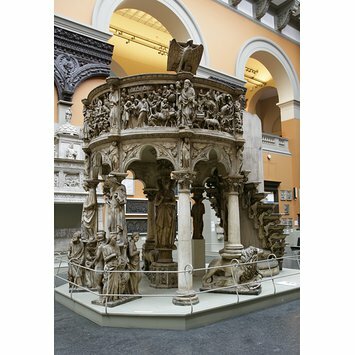 The pulpit now stands on a raised circular base, and has two inscriptions running around a frieze beneath the narrative reliefs and round the base itself attesting to the authorship of Giovanni Pisano, and that the pulpit was completed by 1311. Plaster cast, painted plaster, after the original marble pulpit with columns of porphyry and other stones, in Pisa Cathedral, (on the left side of the nave, before the crossing), by Giovanni Pisano, Pisa, 1302-10. Cast by Giovanni Franchi and Son in London, about 1865. Trusted, Majorie. ed. The Making of Sculpture: the Materials and Techniques of European Sculpture. London: V&A Publications, 2007. p. 163-164, pl. 313. Giovanni Pisano was the son of Nicola Pisano, whose own pulpit is reproduced nearby. Giovanni rivalled his father with his pulpit for Pisa Cathedral. It was of unprecedented size, sumptuously carved and animated with rich colours and gold enamelling. The colours have not been reproduced in this cast, but casting a work of such complexity was a feat in itself. Franchi and Son was one of the most reputed firms of casters at the time, from which the Museum acquired many reproductions.